This one didn't make it in my sketchbook which I'm going to have it at San Diego Comicon. Not because I didn't like it, but I usually draw stuff and forget about it. This is my spoof of Whaleboy. I used to make up BS stories and created BS arts of characters that are little too close to Whaleboy's design. Why? Just to make Patrick Morgan (my pal and partner of Whaleboy) nervous and pissed off. I made Kujirakun as if it was some anime character. Too bad I never showed this one to Patrick nor Eduardo (my other pal and partner of Whaleboy). Patrick would've hated me for this BS too, but I gotta say, he's pretty charming. Hehe Sweet drawing Tae. How many images are needed to put together a sketchbook for Comicon? I'm thinking of putting together one next year along with a childrens book. What's with you and fish... 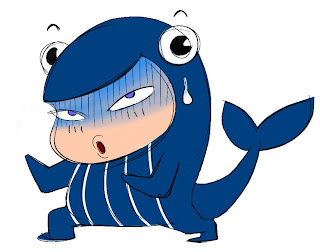 I guess whales are not fish... Who knew you were around drawing whale boy and whatnot. Funky suit hope all has been good !! !